Put off your cloathes in Winter by the fire side: and cause your bed to be heated with a warming pan: unlesse your pretence be to harden your members, and to apply your selfe unto militarie discipline. This outward heating doth wonderfully comfort the inward heat, it helpeth concoction, and consumeth moisture. Hanging a warming pan near the hearth is not just a decorator's idea. The fireplace was always a sensible place for it, so it could easily be filled with glowing coals or wood embers before being taken away to warm the bed. A warming pan, sometimes known as a bed warmer nowadays, was a valuable family possession handed down from generation to generation, but not so expensive that it was only for the rich. 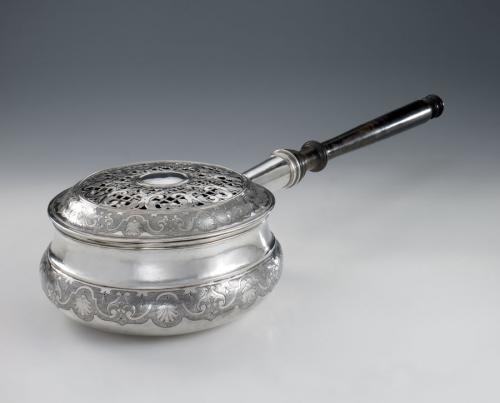 If you were very wealthy you might have a silver one, or a richly decorated copper warmer. 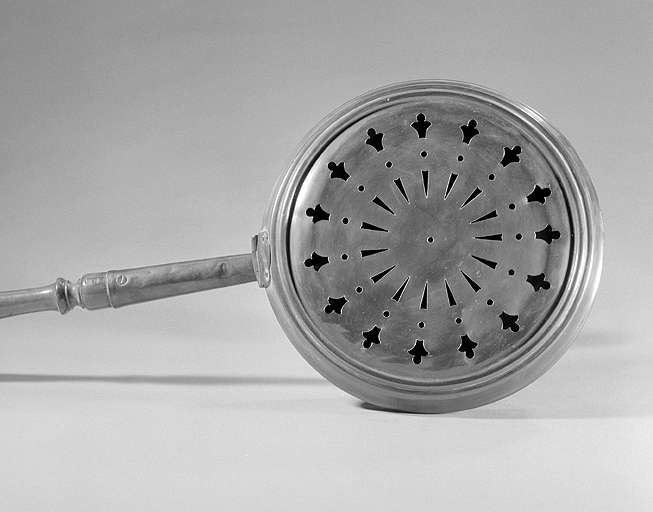 Some of the most ornate warming pans have an elaborate pattern of perforations incorporated in the design. But not all warming pans had pierced patterns. This difference would have been crucial for the servant or housewife using the pan. With air holes, the embers would keep smouldering, the heat would last longer, but the bed would probably smell of fumes and there was an increased risk of scorching the sheets. The smell was not always of wood or coal; in some parts of the UK it was burning peat. In 19th-century England fully enclosed warming pans seem to have been popular: cleaner perhaps, but the heat would have died down more quickly. 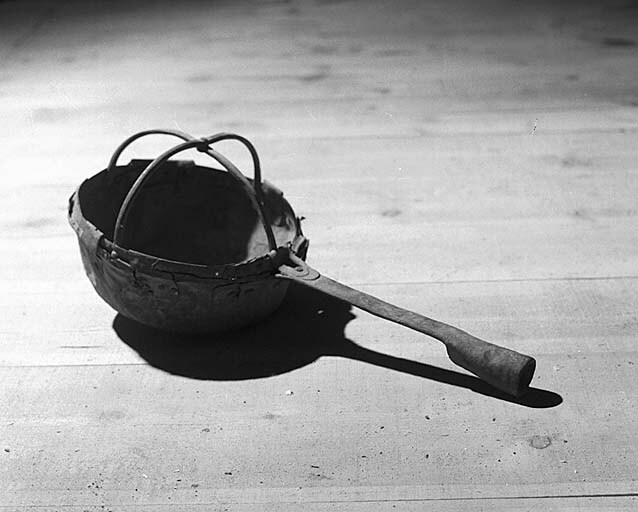 Some warming-pans with solid lids were used with hot water. Others were completely open like this unlidded warming pan from the French Alps. Warming pans on a handle were designed for moving up and down the bed before someone got into it. The handle wasn't always lined up to make it easy to hang on the wall. Some warmers, in Italy or southern France, for instance, were more saucepan-shaped. A copper warming pan is indispensable to a household. Take care to have a big enough quantity of embers, above all some red cinders, when you want to heat a bed. Get it smouldering well before you use it, otherwise the fire will soon go out and the bed will not warm up. You must move the warming pan constantly to avoid scorching the sheets. A bed-wagon (moine), well-known and inexpensive, is a suitable alternative. If you didn't want to stand in a cold bedroom moving the warming pan up and down, you might possibly have a bed wagon. This was a large frame designed to hold a pot of glowing fuel in the centre of the bed. The one in the photograph is shaped like other bed wagons from southern England, but made of oak, rather than the more common ash. An odd-looking contrivance, generally in use in farms in the olden days, was the bed-waggon. It is used for warming a large bed, and must have done its work most efficiently. The one shown [see photo] is three feet long, but they were generally larger. The woodwork is all of oak, the bent hoops passing through the straight rails, which are tied together with round rods. The whole thing is light and strong. A pan of hot embers drops into the trivet, which stands on a sheet-iron tray. Another sheet of iron is fixed under the woodwork above the fire, so that there is no danger of burning the bed. The equivalent in Italy and France looked more like a sledge than a wagon: a sledge carrying a pot of glowing charcoal or wood, sometimes hanging from the top of the frame. This pot could be iron, brass or even earthenware, lidded or unlidded. Unlidded pots might be given a layer of ashes over the fuel. Italian and French bed-wagon frames are traditionally called a monk (moine or monaco) or a priest. Presumably there's some kind of people-in-bed humour there, in the same vein as the English joke about a housemaid being a "Scotch warming pan". Explanations vary. The photo left shows one moine propped up by the wall, and the one below shows it with another moine and an assortment of warming pans near a big kitchen fireplace in a French castlet: the Chateau de Puyguilhem in the Dordogne.